The girls said it would be an important day. I picked out a long skirt and the most feminine shirt I had – a light pink t-shirt – and threw on a scarf for extra humility. 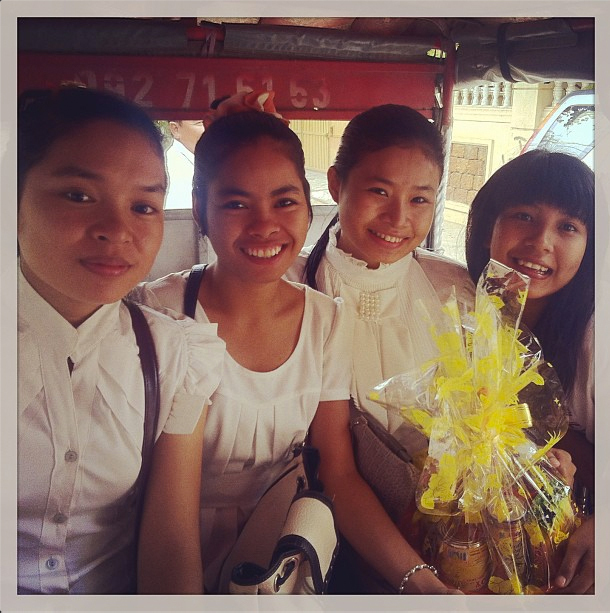 We were heading to the pagoda, or wat, for a service in honor of Pchum Ben, the second most important holiday in Cambodia after the New Year in April. I knew we would be offering rice and I was debating the appropriateness of adding half a bunch of bananas when Gina, the other Leadership Resident, and I heard a soft knock on our door. It was two girls, Sodalin and Pang, giggling and holding a gray plastic bag. They came to tell us that we’d be leaving an hour late because the sisters, or other students, were cooking the offering downstairs. Hearing that cooking was going on, I exclaimed I wanted to help, a request I had made at almost every meal which they refused each time. Sodalin said OK, but then asked me to wait in the room, which I took as another rejection to help with the cooking. Then she launched into a giggle-filled blessing, wishing us and our families health and happiness. In the middle she elbowed Pang, and with another burst of giggles, they dusted fresh flower blossoms on us from the plastic bag. 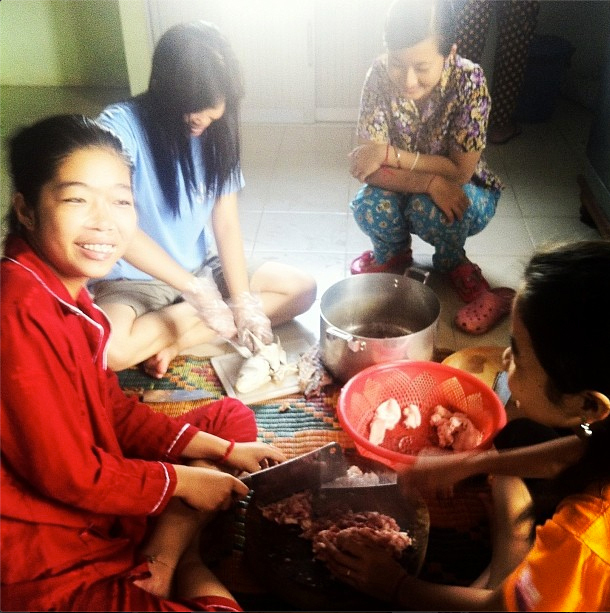 Still smiling, I wandered downstairs to the kitchen and saw a circle of sisters preparing the meal – an intricate combination of finely chopped fresh fish and pork skin, which they mixed with eggs to make a thick paste, almost like a mixture we would use for meatballs. One sister explained they would cook this over the stove and offer it to the monks when we arrived. When the cooking was complete and everyone was dressed in their best, usually a dark skirt, a pressed white shirt and nice sandals, we piled into tuk tuks and took off. 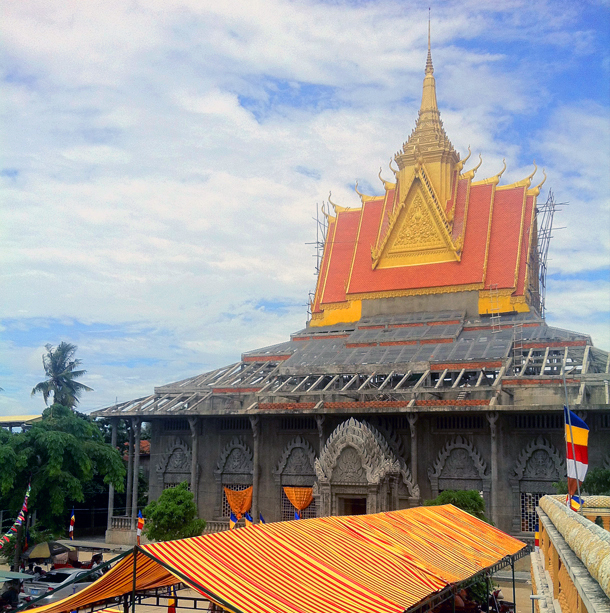 I sensed we had arrived when I heard the notes of Khmer xylophones and saw colorful flags donning the entrance to the pagoda. 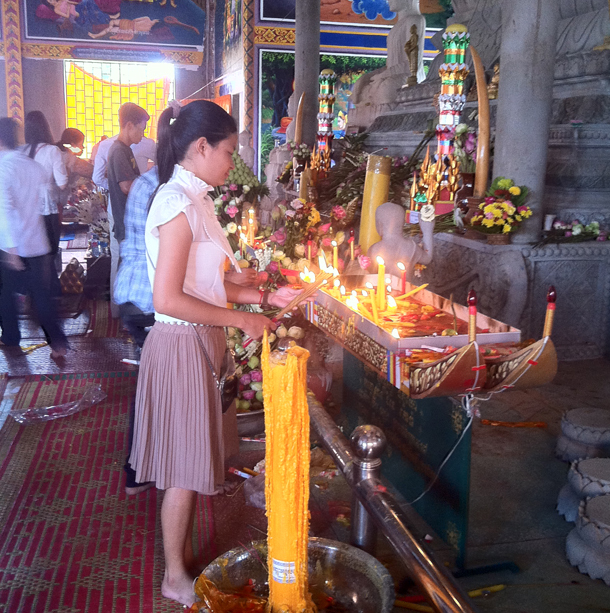 The air was thick with the scents of incense, savory foods, and fresh flowers. We removed our sandals and entered the bottom level of the pagoda. There were people in their finest clothes – including silks – walking, sitting, praying and making offerings of food. We took the food to a seated monk for a blessing before dividing the rice amongst individual ceramic bowls. We each took a spoonful from our bowls and added them to large metal pots, one for each ancestor. After the offering, we lit incense and prayed. 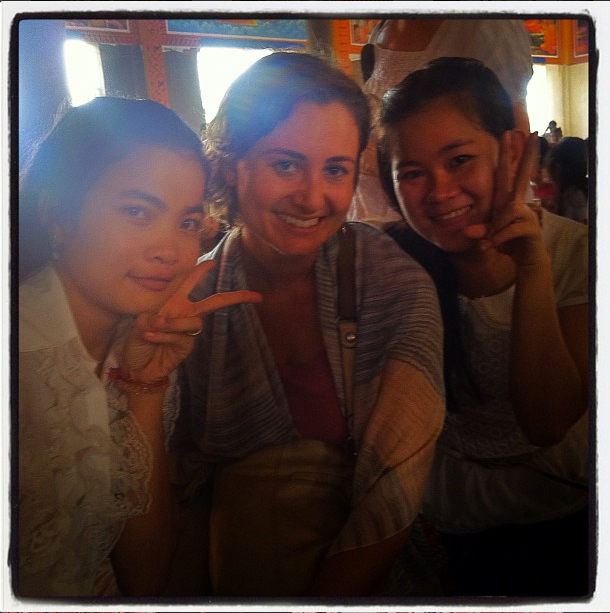 I prayed for the girls and teared up with appreciation for being here with them. 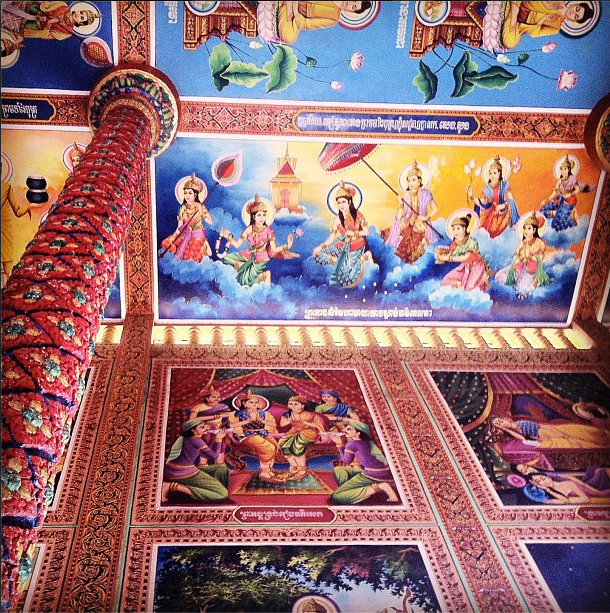 Once everyone who wanted to had a turn with the incense, we climbed dragon-donned stairs to the adjacent building and entered a stunning room covered from floor to ceiling paintings of stories about the Bhudda. 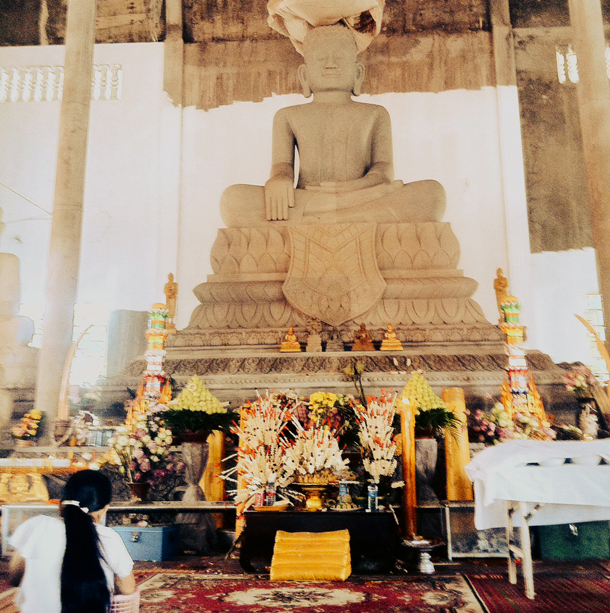 Here we perched on floor mats, praying to the larger-than-life statue of Bhudda and waiting our turn to be blessed by two young, lighthearted monks. (I caught them giggling when we walked in!) When our turn came, we piled around them and raised our hands to prayer position as they chanted and blessed us with drops of water. We returned to the offering room, where another monk was chanting while others walked through the crowds with jasmine flowers and a bowl of (bottled) water. We paid a 100 or so riel (equivalent to a few cents) for the blessed water, which they dripped in our hands with the flowers and we rubbed on our faces and hair. Then we sat on the floor mats and continued to pray. After about two hours total, we had paid our respects and returned blessed and refreshed to the tuks tuks. I feel like I followed you around on this special day. Thanks for sharing your experience – I can’t wait to hear more about the girls you’re working with/teaching/learning from :). The email about this post has been sitting in my inbox for over a week! I finally got around to reading it and it sounds marvelous! I wish I could have gone with you…it sounds beautiful and peaceful and spiritual in a way I haven’t felt in a long time. I hope you continue to have such good experiences!